Erica Bentencourt often has to juggle her schedule, and sometimes on short notice. Compared to many fast-food workers, Erica Bentencourt has a fairly set schedule. She is supposed to work in the kitchen at the Holbrook Burger King Tuesday through Saturday, opening at 5 a.m. and leaving at 2 p.m. But when coworkers call in sick, she is often asked to stay late or come in on her day off. When business is slow, she is sent home early. Working extra hours means she has to scramble to find child care for her 9-year-old son. But working fewer hours is worse. “When they start to cut hours, it affects me paying my bills,” said Bentencourt, 33. A federal bill reintroduced last week and cosponsored by Massachusetts Senator Elizabeth Warren, as well as bills in 10 states, including Massachusetts, would require employers to stabilize schedules, from posting work shifts several weeks in advance to giving additional pay to workers who are on call, or whose shifts are cut or changed on short notice. 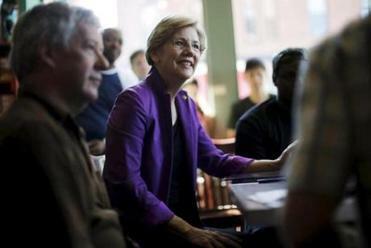 Senator Warren met with workers in Boston on Monday to discuss a bill dealing with how employee shifts are scheduled. In San Francisco, the Retail Workers Bill of Rights, which guarantees similar protections for employees of chain restaurants and retail stores, went into effect this month. And Democratic presidential candidate Hillary Rodham Clinton gave a nod to the need for “fair scheduling” in a speech last week. The Warren bill will face a tough battle in Congress, and it is unclear if the state bills will gain traction. But fluctuating schedules are still firmly in the spotlight. About 17 percent of the workforce has an unstable work schedule, according to the Economic Policy Institute, a Washington, D.C., advocacy group for low-income workers. These schedules — often generated by software that calculates how many workers are needed at certain times, alerting managers when business is slow and they can send people home — are sometimes referred to as “just-in-time” schedules. More employers are using software to manage their increasingly part-time workforces, knowing that workers hungry for higher pay won’t balk at taking shifts at inconvenient times, said Naomi Gerstel, a University of Massachusetts Amherst professor whose book “Unequal Time” addresses unpredictable work schedules in health care. Bentencourt, the Burger King worker, said she feels obligated to pick up the extra shifts, even on short notice. The subsequent variability in her pay means that some months she doesn’t qualify for food stamps. The manager at Bentencourt’s Burger King said the store does not often change workers’ shifts at the last minute, and that making schedules more regulated would be difficult. In Massachusetts, business owners are pushing back against the proposed changes, which they say would add to the growing costs and paperwork caused by other recent regulations, such as a mandate for paid sick time and increases in the minimum wage. Adding to the strain are federal efforts to make more workers eligible for overtime and fewer eligible to be independent contractors. 17% of the US workforce has an unstable work schedule. From a child care provider in Marlborough to a theater owner in Wellfleet, business owners are distressed about the possibility of losing their scheduling flexibility. In one 30-minute stretch on a recent day, Quincy restaurant owner Greg McDonald had to find someone to cover for an employee who quit on the spot and arrange for extra staff to accommodate a large last-minute reservation. McDonald, whose businesses include the Chowder House and Darcy’s Pub, gives employees set schedules when he can, but shifts at his sit-down restaurants are usually determined three days at a time. The House bill currently applies to all employers, but its sponsor, Representative Sean Garballey, Democrat of Arlington, said he plans to recast the bill to apply only to large retail operations and fast-food restaurants, as the Senate version does. As workers’ concerns have come to light, several companies, including Walmart, have started adjusting their practices. This year, Walmart started a pilot program to offer employees a fixed schedule for a year. Starbucks, in response to a New York Times article detailing a worker’s erratic hours, last year said it would start posting schedules a week in advance and limit the practice of assigning workers to close a store and then open it the next morning. Set schedules may actually be beneficial for businesses, said Joan Williams, founding director of the Center for WorkLife Law at the University of California Hastings College of the Law in San Francisco. Williams is about to launch a pilot program with Gap Inc. that will implement stable schedules at some stores and compare their performance with those that continue to give workers less predictable shifts. Research suggests that there is a cost to irregular schedules, she said, including high turnover and absentee rates.